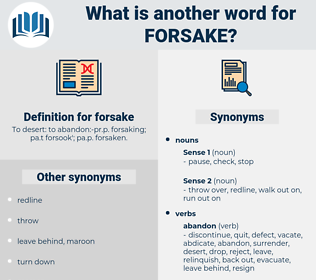 What is another word for forsake? To desert: to abandon:- pr. 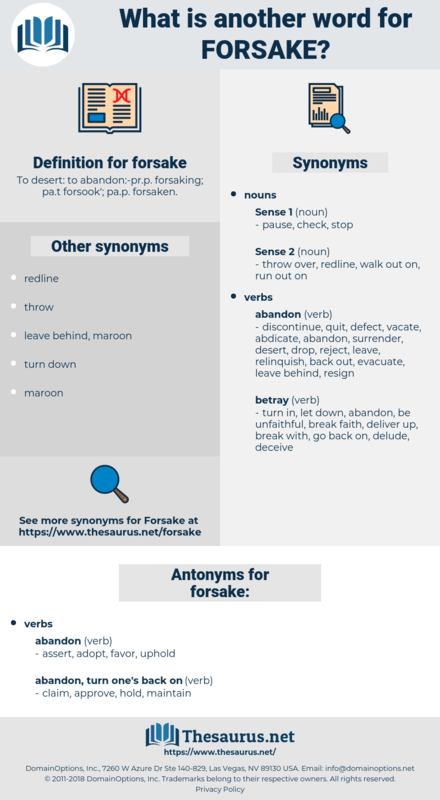 p. forsaking; pa. t forsook'; pa. p. forsaken. relinquish, forego, forgo, waive, surrender, abdicate, forfeit, discontinue, resign, jettison, abort, abolish, vacate, withdraw, reject, abrogate, refrain, eschew, renege, terminate, scrap, desert, flee, rescind. renounce, discard, dispense, cease, lose. defend, be loyal, protect, support, be faithful. affirm, allow, concede, corroborate, go along, grant, acknowledge, agree, accede, confess, admit. continue, keep to, linger, stay, wait. assist, aid, come back, help. rediscover, go back, return, revert. cherish, advocate, withhold, haunt, redeem, pursue, court, possess, prosecute, harbor, own, save, have, rescue, vindicate, seek, occupy, undertake, reclaim, reserve. Those two mother murres were not going to forsake their babies! But the Lord Jesus Christ did not forsake them; they were sustained by His abundant grace.